In the tradition of Osler, the diagnosis of IE is apparent when patients present with the classical clinical findings. Unfortunately, most patients do not present in this classic manner and the diagnosis of IE is often difficult to establish. The main components—history, physical exam, lab investigations, chest x-ray, electrocar diogram and blood cultures—are the mainstays of clinical diagnosis and have led to diagnostic algorithms proposed by Pelletier, von Reyn, and the group from Duke University. Figure 6.2. 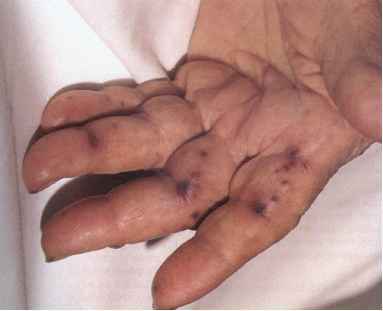 Janeway lesions—Hemorrhagic, infarcted macules and papules on the volar surfaces of the fingers (in a patient with S. aureus endocarditis). (Color Atlas & Synopsis of Clinical Dermatology, Fitzpatiick, TB, et al.McGraw-Hill, © 2001, with permission of the McGraw-Hill Companies). Figure 6.3. Submucosal hemorrhage of the lower eyelid in an elderly diabetic patient with enterococcal endocarditis. Splinter hemorrhages of the nail bed and Janeway lesions were also present. (Color Atlas & Synopsis of Clinical Dermatology, Fitzpatrick, TB, et al. McGraw-Hill, © 2001, with permission of the McGraw-Hill Companies). intravenous drug use, indwelling intravascular catheter, etc.). IE, the lungs (producing septic pulmonary infarcts). Cutaneous manifestations such as petechiae (usually on the extremities) are the most common manifestation but are nonspecific. Mucous membrane petechiae can be seen on the palate or conjunctivae (often seen with eversion of the eyelids). 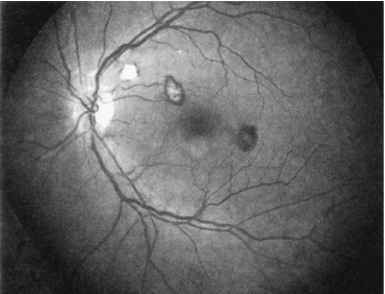 Janeway lesions (macular, blanching, nonpainful, erythematous lesions on the palms and soles—see Figures 6.2 and 6.3), Osler's nodes (painful, violaceous nodules found in the pulp of fingers and toes—see Figure 6.1), and Roth spots (Figure 6.4) are more specific for IE but are not diagnostic . The relative frequencies of the various symptoms and signs are provided in Table 6.1 . Figure 6.4. 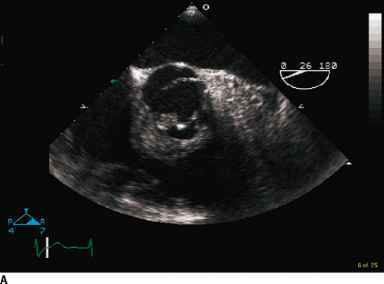 Roth spots—A 40-year-old woman with rheumatic valvular heart disease and Strept.viridans endocarditis.Three lesions, from left to right, demonstrate the evolution of a Roth spot (Circulation 1999;99:1271, with permission from Lippincott Williams Wilkins). Source: Adapted from Mandel GL, Bennett JE, Dolan R. Principles and Practice of Infectious Diseases.6tl: edition.Philadelphia: Elsevier Churchill Livingstone, 2005. With data from [24,52-54].